the summer dress | to take me from weddings, to al fresco dinners, to Easter, and everything in between. I love the color and simple silhouette in the j.crew dress above. sandals, sandals, sandals | I love sandals, and every year, I buy a pair or two to herald the return of pedicure season. I’m loving the chic simplicity of the see by chloe pair and the buttery cognac and low chunky heel of the j.crew pair. I also love that both can be dressed up or down easily. 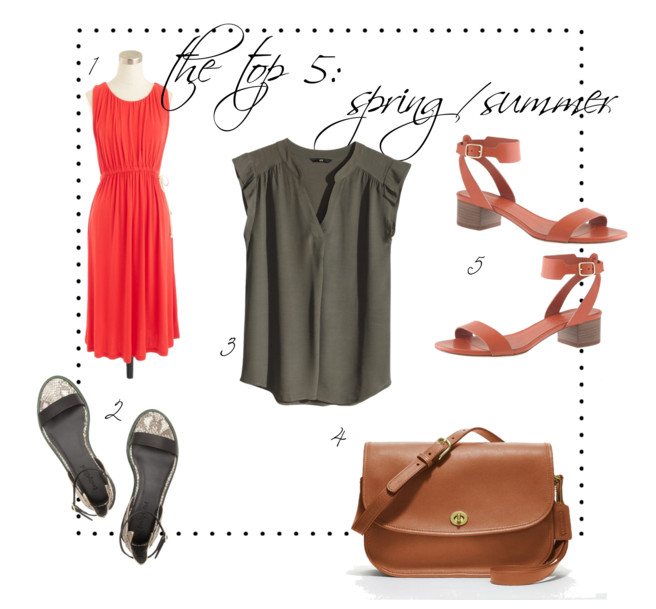 the flirty top | I like my clothing to be loose and free during the warmer months. I love that this h&m blouse looks so comfortable yet so put together with its pleating, flattering neckline, and the hint of a flirty cap sleeve. and the color is beautiful. the crossbody | because being hands-free in the summer is a must. I’m having a cognac moment, and this coach bag is in the loveliest shade of it. it’s a little boho, a little urban, and 100% classic.